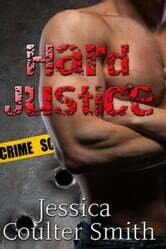 Dirty cop, Travis Malloy, has kept psychic, Bliss Dougan, under his thumb for a year. But as his jealousy rages out of control, she finally finds the break she’s been waiting for. Escaping into the night after an epic fight that’s left her scared and bruised, she does the only thing she can—she hides. When the ghost of a recently deceased woman appears, imploring her for help, Bliss knows that Malloy’s dirty dealings are much worse than she’d feared, and she’ll stop at nothing to take him down. Officer Justice Wild has always believed in the oath he took when he donned the badge, and he’s always been a sucker for a woman in need. Bliss tugs at his heart strings, even if he does think she’s completely crazy. When her insane ramblings about ghosts and Officer Malloy start making sense, he wonders if he’s lost his mind, or if he’s ready to believe in the supernatural. Justice might have been prepared to do anything to put Malloy behind bars, but he hadn’t counted on falling for the sassy psychic who won’t leave his side.